The 2018 Subaru WRX debuts its newly restyled front fascia, upgraded performance and sportier attitude for a ride that rivals luxury sports cars. Offered in the WRX or WRX STI models, this Subaru puts peak-performance in the driver seat to create a car you'll truly love. Read on below to learn more about the exceptional power and exciting capabilities of the 2018 Subaru WRX! With two unique engines offered for drivers to choose from, the 2018 WRX provides powerful performance and a smooth, natural-feeling drive. The first engine option for this exceptional vehicle is a 2.0-liter direct injection turbocharged BOXER engine capable of generating 260 horsepower, and which features Symmetrical All-Wheel-Drive, and the Active Torque Vectoring system. 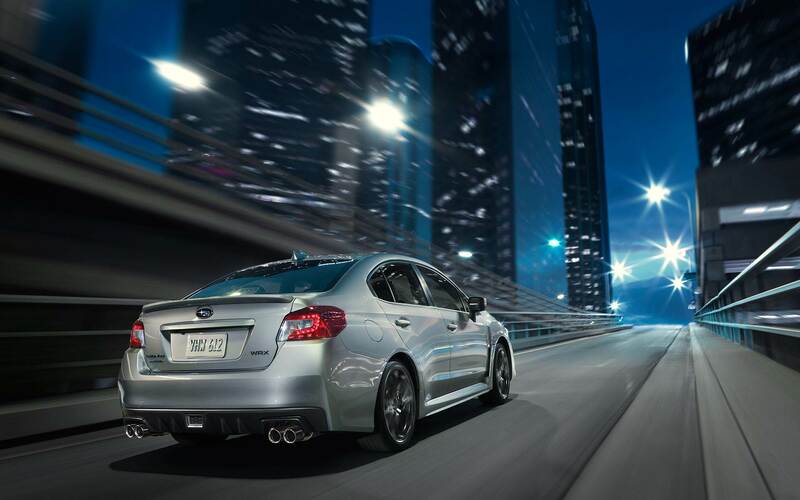 The WRX features a standard six-speed manual transmission, though a Sport Lineartronic continuously variable transmission (CVT) with a manual mode is available as an option. Newly enhanced tuning on the front and rear suspension have improved ride-quality and comfort, while also increasing steering stability and control. Shifting in the WRX has been significantly enhanced, thanks to a new synchro design and friction reducing strategies, while a revised electric power steering system integrates the steering motor and electronic control unit to reduce weight. The rally-bred 2.5-liter optional turbocharged BOXER engine that comes on the WRX STI provides 305 hp, and features a Multi-Mode Driver-Controlled Center Differential. Active Torque Vectoring, Symmetrical All-Wheel-Drive and the Multi-Mode Vehicle Dynamics Control Center are all found on the 2018 Subaru WRX STI. Even the WRX STI's wheels get an upgrade, with the models first-ever 19-inch alloy wheels featuring a striking Y-shaped spoke design and large performance-based tires. The Subaru WRX features upgraded interior materials and a redesigned cabin for the 2018 model year. Noise reducing enhancements like extra-thick door glass, a foam-filled windshield header beam, and stronger door seals create a vault-like retreat from commuting noise. The WRX features a larger high-definition multi-function display screen that allows you to intuitively interact with the WRX's infotainment systems. The optional Performance Package has distinctive red-painted brake calipers and upgraded JURID brake pads to the WRX, in addition to Recaro eight-way adjustable front seating for the driver and weight-reduction technology that removes the moonroof. The WRX features an updated braking system with Brembo brakes, exciting yellow-painted brake calipers, drilled rotors and new brake pads for improved braking performance. 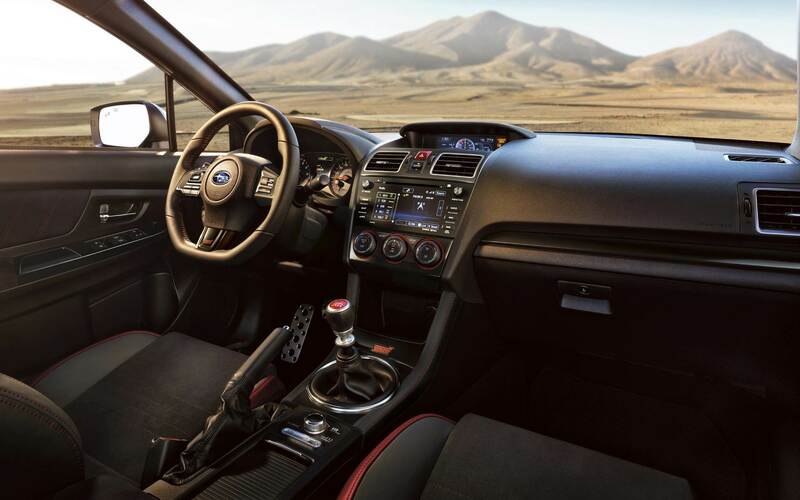 The WRX STI gets a sport-designed instrument cluster with LCD lighting, the Recaro seating found on the Performance Package, faster remote trunk opening response times, upgraded interior materials and roof rack mounting brackets. Rear seat armrests cupholders and redesigned interior door grips make the WRX STI a more passenger-friendly performance sedan. The 2018 Subaru WRX is a performance-driven vehicle with sophisticated styling that is sure to turn heads. Where can I learn more about calculating my future payments? Our Finance Center offers a handy Payment Calculator to help you plan your budget! Click for our payment calculator! What's the maximum horsepower of the 2018 Subaru WRX? 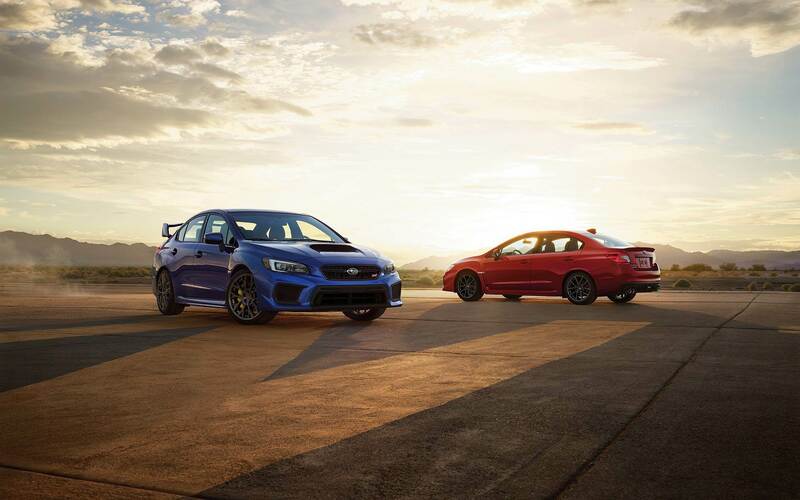 The WRX maxes out at 260 horsepower, while the WRX STI generates 305 horses! Can you help me find tires? Yes, we can! Visit our Tire Store to learn more! Click to see our tire selection! A full suite of advanced safety and security functions are included to protect the driver and passengers of the WRX and WRX STI. A revised front structure enhances frontal collision performance, while advanced features like EyeSight Driver Assist Technology Services make the 2018 Subaru WRX a smart choice. The EyeSight Driver Assist Technology Services include Auto Vehicle Hold, and an EyeSight Assist Monitor, which uses LED indicators on the windshield to alert the driver to danger without requiring that the driver remove their eyes from the road. The Auto Vehicle Hold System features hill hold and hill start assist functions which provide better traction and greater functionality on all road grades and inclines. The 2018 Subaru WRX is an excellent vehicle for families and provides the peace of mind you need to feel confident in any driving condition. Stop by Reedman Toll Subaru of Downingtown in Downingtown Pennsylvania and test drive the 2018 Subaru WRX today!